Allen Harim will phase out spray-irrigation at its Dagsboro hatchery, where it has been dispersing nitrates into the groundwater. Poultry producers are again being cited for nitrate overload to groundwater. This time, officials said, Allen Harim exceeded permitted nitrate levels in wastewater that is spray-irrigated at their Dagsboro hatchery, located at 26867 Nine Foot Road, about a mile west of Route 113. On Oct. 31, Delaware’s Department of Natural Resources & Environmental Control (DNREC) announced a Conciliation Order by Consent with Allen Harim, to settle violations at Allen Harim’s Dagsboro hatchery and the Harbeson poultry processing plant. Allowed a nitrogen loading maximum of 260 pounds per acre per year, Allen Harim’s wastewater instead reached 872.3 and 407.9 pounds per acre in 2016 and 2017, respectively. Groundwater monitoring wells also exceeded the drinking water standard of 10 mg/L for nitrate nitrogen, averaging 23.95 mg/L in 2016, with a June high of 32.7 mg/L, and 25.65 mg/L in 2017, with a November high of 27.8 mg/L. “These incidents appear to be related to the use of high-ammonia chemicals, process overloads and various other circumstances,” the conciliation order states. Typically at the plant, effluent is pumped from a 150,000-gallon storage lagoon to a pump station and sprayed onto approximately 11.15 acres of grassy area behind the plant. They are permitted to pump an average of 15,000 gallons per day. In theory, that is an efficient way to reuse water and fertilize crops with nutrients. But both Mountaire Farms (which currently faces class-action lawsuits over such issues) and Allen Harim are experiencing the downside of when that process fails. In winter, all the Dagsboro effluent is instead trucked to the Harbeson wastewater facility. Their permit also regulates effluent amounts, pH, chloride, sodium and more. “Allen Harim has terminated all spray irrigation activity at the Dagsboro hatchery and does not intend to resume spray irrigation activities under their state permit 358994-04,” the document reported. Instead, Allen Harim proposes to close the spray facility and connect to the Sussex County wastewater treatment facility. Plans have been formally submitted to the County for review, and the connection could be completed within a year of approvals. “Conciliation” reflects the mutual effort by the parties to attain compliance, settling both the poultry processing and hatchery facility violations. Allen Harim must pay an administrative penalty of $300,000, of which up to half may be instead invested in repairs, plus $7,888 for abatement expenses. Allen Harim is expected to fund a nature conservancy project to improve agricultural runoff and groundwater nutrients in the Broadkill River watershed. The project must be planned, earn DNREC approval and begin within 120 days. The agreement is binding and enforceable against all parties and their successors. Moreover, Allen Harim may not publicize the improvements, unless they prominently state that the project regards an enforcement action. The topic of Dagsboro came up while DNREC and Allen Harim were addressing numerous past wastewater violations at the company’s Harbeson poultry procession plant. Their Harbeson plant was overloading ammonia, phosphorus, total suspended solids and bacteria into Beaver Dam Creek, which leads to the Broadkill River. “These incidents appear to be the direct result of equipment failures, process overloads and various other circumstances” that violated the National Pollutant Discharge Elimination System (NPDES) wastewater permit, leading to DNREC’s issuing a Notice of Administrative Penalty Assessment and Secretary’s Order. Soon thereafter, Allen Harim completed Phase 1 of Harbeson wastewater treatment upgrades, which have improved the situation there. Allen Harim did not respond to Coastal Point’s phone or email requests for comment before our press deadline on Wednesday. After DNREC fined the company in March for wastewater violations, President and CEO Joe Moran emphasized “more than $8 million on upgrades to our wastewater treatment plant in Harbeson,” which led to 100 percent compliance with the discharge requirements in their NPDES permit. The company also plans to stop pumping directly into the Beaver Dam Creek. Instead, all wastewater from the Harbeson poultry plant could be spray-irrigated north of Milton (although the permits are facing appeals from local environmental activists). Artesian Wastewater Management is building a pipeline from Allen Harim to their Northern Sussex Water Recycling Facility, from which they’ll spray-irrigate nearby crop fields. Allen Harim is also seeking to ship wastewater to Harbeson from its proposed Millsboro deboning operation. The Dagsboro hatchery was built in 1973 by Cargill, which sold the hatchery and the Harbeson processing plant to the former Allen Family Foods in 1988. During a 2011 bankruptcy scare, Allen was acquired by the Harim Group of South Korea. 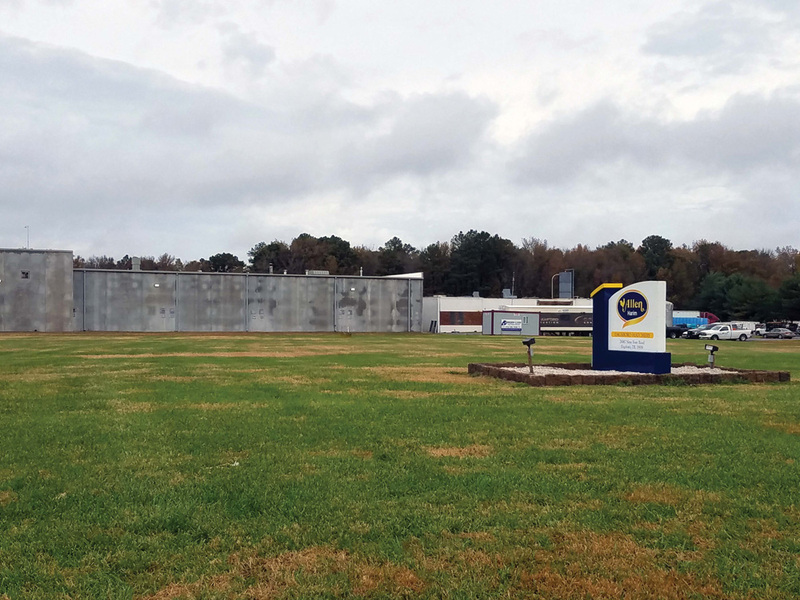 In 2017, the new Allen Harim broke ground on the new $22 million hatchery in Dagsboro, and in 2018 moved its corporate headquarters to the former Vlasic Pickle plant in Millsboro. Allen had previously been headquartered in Seaford since its founding in 1919. The Secretary’s Order No. 2018-W-0057 is posted online at www.dnrec.delaware.gov/Info/Pages/SecOrders_Enforcement.aspx.